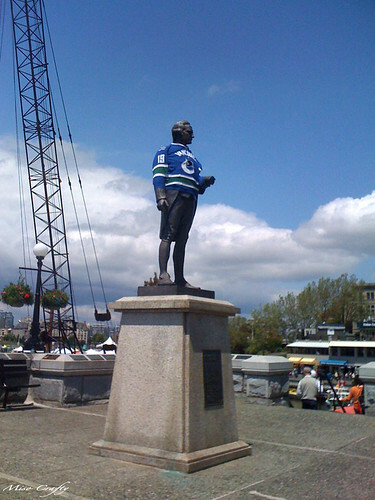 Will the Canucks be able to bring Lord Stanley home? The game hasn't even started yet and already I'm stressed out. I'm not a nail biter, but right now my nails are taking a beating. While checking out the downtown scene on Saturday afternoon I came across the Sir James Douglas statue that's across the street from The Empress Hotel. Normally I don't pay attention to it (I walk by it at least 12 times a week) but this time I couldn't help it. I also couldn't help smiling. Canucks fever is in the air. Even Sir James agrees.